May 6, 2015 4:55 am. Parlay betting or multiple betting in horse racing is a popular option for punters either wanting a massive pay day, or those wanting to cover their bases with the wide range of boxing multi options. A multi bet is a bet type where the punter can combine single bets into one bet. The odds for each single bet are multiplied by the next bet. A multiple bet is not restricted to just “two legs” either with it even possible to make bets cross into different sports or racing codes. For the punter to get a payout they would need EVERY leg to salute, if this occurs the winnings is calculated like this: $10 x $2.40 x $1.80 x $1.40 = $60.48. Most bookmakers only allow fixed odds prices for their multi bets, many bookmakers give punters great value by offering not only fixed odds, but also Top Tote and Country Best (best dividend for Victorian and NSW totes for place betting options) – this would only apply to the place bet on Dissident as shown above. Most online bookmakers have Top Tote, or their own variation of this. We will use Sportsbet’s Top Tote as an example, with this option giving punters the best price available across the Victorian TAB, New South Wales TAB and Sportsbet.com.au. This guarantees punters of the best price available which makes a massive difference for multi-bettors. If Black Caviar was paying $2.20 to win, instead of $1.80, then the above multi-bet would have paid $73.92. That’s a difference of $13.44 per $10 bet which could make the difference between making a profit or a loss. The amount of legs available in a multi-bet differs between bookmakers. Most bookmakers are happy to accept 14-leg multi’s, but Luxbet.com offers up to 15. Some bookmakers will limit how much a single multi-bet can win. Offshore bookmakers have been known to have a $250,000 limit per bet, but punters work around this by either having multiple bet slips or placing the bet in person when applicable. Often there is reports from bookmakers about the punter who turned $10 into $60k, but encouraging us to put these types of bets on shows just how unlikely pulling one off is. Boxed multi bets are the same as regular multi bets, but the number of bets differ. For example, if your multi includes five options you can then choose either a Double, Treble or 4 Fold when having a bet – or stick with your original five-leg bet. The Double gives you 10 individual multi bets containing 2 legs. The 10 bets cover all possible combinations of your 5 selections in lots of two. Treble bets work the same way, but each bet contains 3 legs. Boxed multi betting allows punters to box up all their selections without all runners having to win. The payouts will be lower but it’s the more safe option for punters who choose this method. 4 bets comprising 3 selections from different races. This means punters get 3 double bets and one treble. At least two selections must win to receive a return. The Patent gives you 7 bets featuring 3 different races. At least one of the above must win for a return. 11 bets comprising 4 selections from different races. The Yankee is conditional that 2 selections must win to earn a return. 15 bets comprising four selections from different races. Only 1 selection must win for a return. The more multiple options available, the higher the cost is to place the multi bet. The following options are for the punters with a little more coin to spend, but the payouts can be very rewarding. 31 bets comprising 5 selections. 1 selection must win to collect. 57 bets comprising 6 selections from different races. At least two selections must win. The grand daddy of all multi bets, comprising of 247 bets over 8 different selections. 2 selections must win for a return. 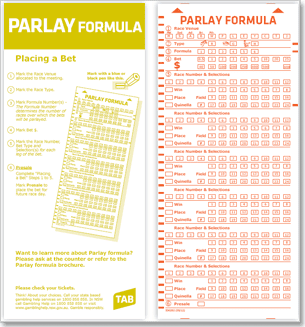 Bookmakers in Australia make it very easy to place multi bets with them. Simply find the races you want to bet on, click on the desired horse and it will appear on the bet slip which sits on the right hand side of the page, or similar at most bookies. Once you have two or more options on your bet slip, options for a multi bet will be available under “Multibet”. The combined odds will be shown as one total selection and punters will get the opportunity to change their multi-bet on their bet slip. You can change from win to place or each way, and whether or not your odds are fixed, top tote, top fluctuation or country best. Top fluctuation gives punters the highest price offered by bookmakers on the selected horse. This option is great for getting the best value possible before the big bets lower your odds. Once your selections have been made, simply put in the amount you want to bet where it will display your potential returns. Click on bet and enjoy the racing.